A supremely lightweight, compact and fast Nikon lens that offers the more economical f1.8 aperture (compared to the 50mm f1.4 D), yet it still retains the great advantages of the D distance technology. It is ideal for travel, portrait, scenery or full-length portraits. It weighs just 155g (0.34 lb), making it great for travel while still offering excellent low light gathering properties. Stops down to f22 for wonderful control over the depth of field. 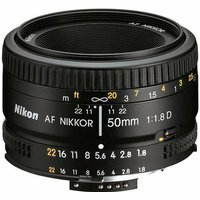 Accepts 52mm filters and the Nikon HR-2 lens hood.